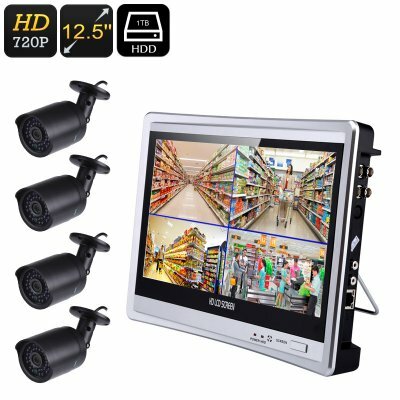 Successfully Added Four Channel DVR System - 20m Night Vision, 4x IP66 Waterproof Camera, 12.5-Inch Monitor, 720P HD, Local Playback to your Shopping Cart. This 4 channel DVR kit offers great solutions for those who wish to upgrade their property’s security. Whether you use it at home, in the office, or to protect your warehouse – this security system provides great protection. It comes with four HD cameras that each features a wide viewing angle. Thanks to this, not a single movement around your property will stay unnoticed. The cameras of this DVR system have been equipped with a 1/4-Inch CMOS sensor and 3.6MP lens. This equipment is guaranteed to produce high-quality recognizable images for you to enjoy. From now on, nobody will be able to approach your home or business unnoticed. The IP cameras that come with this DVR system feature a durable IP66 design. This makes them completely waterproof and allows you to use them in any sort of weather condition. Whether it is snow, ice, or rain – nothing will stop them from working. Additionally, they come with a metal housing that protects them from impacts. With their separate wall mounts, these security cameras are easy to install at any place of your liking. Once in place, they’ll keep an eye out for unwanted visitors and make sure nobody comes near to your property without you being aware. Thanks to its PTZ control support, you’ll be able to manually control your cameras from afar. This lets you check on people and inspect suspicious situations without needing to be physically there. Each camera furthermore comes equipped with IR LEDs. These provide you with 20m night vision to ensure that your property is also secure at night. With a transmission distance up to 500m, this DVR system is great for monitoring large areas. The DVR kit comes with a large 12.5-Inch display on which you’ll be able to watch back previous footage. Finding back old footage can be done by searching by time, date, event, or channel. This DVR kit has different recording modes including manual, alarm, motion detection, and time recording. Thanks to this, you can be assured that not a single movement stays uncaptured on your new DVR system. It comes with a 1TB hard disk, meaning it packs more than enough space for you to store all your recordings. This DVR kit comes with a 12 months warranty, brought to you by the leader in electronic devices as well as wholesale electronic gadgets.. I was pleasantly surprised it was packaged very well,I was worried about the screen having a break in it, coming from China but it all came in one piece, and the shipping was very fast. This is my second Security system I have ordered through Chinavasion, the first one has worked perfectly, it is just time for an upgrade, so I went with Chinavasion again and very happy I did.